Deep Water Culture (DWC) is a hydroponic gardening method in which plants are grown directly into a large pool of nutrient solution. Typically, plants are placed in net baskets full of a growing medium such as perilite or expanded clay pellets. 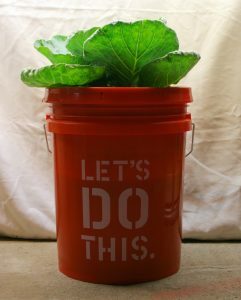 These baskets are then placed in a reservoir (5 gallon hardware store buckets are a popular choice among hobbyists) to submerge the plant roots. The root mass will continue to grow down into the reservoir, slowly filling it with loosely packed roots. 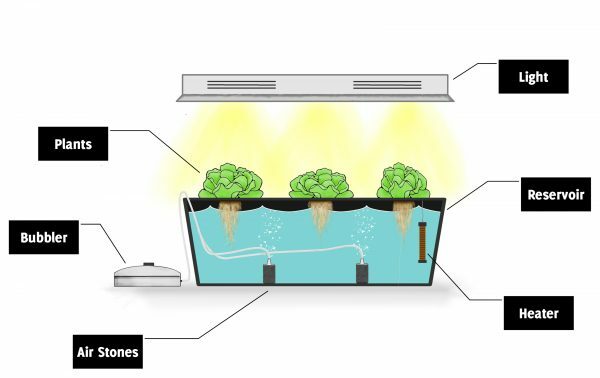 DWC systems require a well oxygenated nutrient solution to keep the roots from drowning and rotting – an air stone and a bubbler are often used to sustain adequate dissolved oxygen levels. As plants consume water, the reservoir level will recede, exposing the roots to even more oxygen and promoting prolific growth. The downside of frequently changing water levels is that pH and EC levels tend to fluctuate, especially in smaller systems. Maintaining a large number of small reservoirs, such as 5 gallon buckets, can also become tedious. To combat this, recirculating designs are implemented to tie together smaller reservoirs into one large system, which will tend to be much more stable and require less work. The benefits of deep water culture comes from the simple design with few moving parts – a bucket and an air stone are the only real requirements. This simplicity makes it a very accessible growing technique for beginners or budget growers. Additionally, the high levels of oxygen exposure experienced by the roots encourages robust plant growth and provides optimal growing conditions for many types of plants – especially fruiting plants such as tomatoes and peppers. This type of system is also very fault-tolerant, since a power outage or equipment failure won’t prevent plants from receiving the water they need. AirSense monitors air temperature, humidity, and pressure, and ambient light level, to track changes in the environmental growing conditions. RelayDrive controls lights, bubblers, fans, and heaters to regulate growing cycles. WaterSense monitors water level and temperature to maintain the water reservoir. The Master Control computer manages communication, scheduling, and logging to the database. DWC style hydroponic growing is a simple, low-cost way to grow a wide variety of plants. No matter what type of plant you grow, HydroBot’s modular and flexible design can be easily adapted and scaled to meet your needs. HydroBot is an open-source hardware and software project. All source can be found in the HydroBot repository, and more posts about the project can be found here on the Protofusion Blog. Original artwork by Kayla Curtis.